From 26 October to 7 November, Salone in Roppongi, the biggest ILC-theme exhibition so far was open to the public in the heart of downtown Tokyo. Its parent exhibition, Tokyo Midtown Design Touch http://www.tokyo-midtown.com/jp/event/designtouch/english/ drew close to 1.5 million visitors during the duration of the event, and Salone in Roppongi was visited by more than 40,000 people. Salone in Roppongi was started four years ago to showcase works from internationally recognised Japanese designers. This time the theme was to showcase science through design. Architect Jo Nagasaka depicted the complex world of particle physics in a unique and easy-to-understand way. This year’s exhibition was also exciting because many young students – who might become future ILC facility designers and builders –participated in the project. The project started in September. 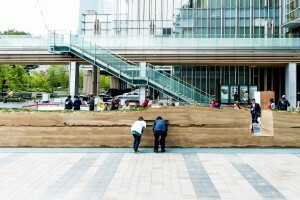 The students gathered at Nagasaka’s office , Schemata Architects, in Tokyo, and started to build a two-metre-long wooden base for the rammed-earth mock-up. 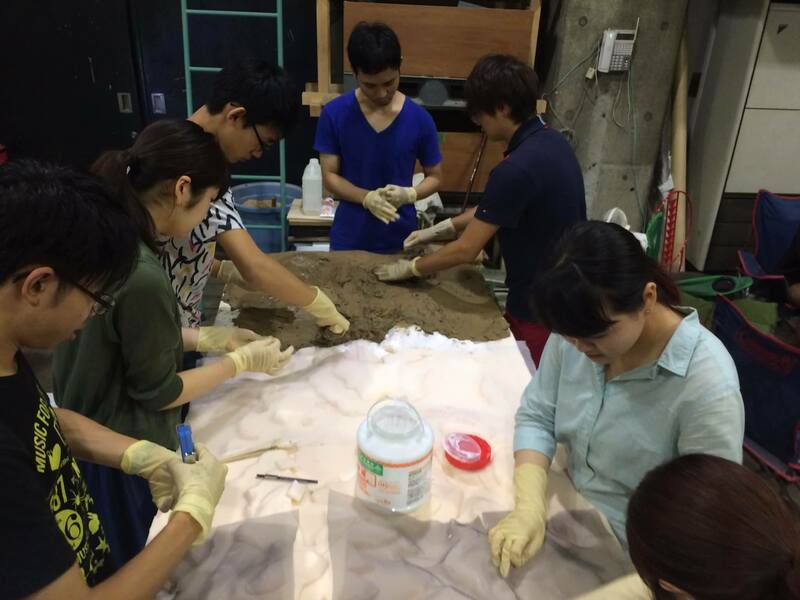 They also prepared a styrofoam topographical model of the Kitakami region to put on top of it. Both activities were supervised by Kohei Hayashi, an architect at Schemata Architects. Four days later, they moved to another architect studio, TANK, to finish up the mock-up by elaborating the geographical model to make up mountainous landscape with cement, and keep ramming and ramming the earth for three hours. “Rammed earth requires so much energy. We had a decent number of staff, but it took us three hours straight to finish only the two-metre model. I started to wonder how many hours and staff it would require to achieve the 15-metre exhibition,” said Ryuichi Ozeki, first year student at Department of Architecture, Musashino Art University, one of the leaders of the student team. The team discussed and refined the design and the building method, and started to build real exhibition model in mid-October. 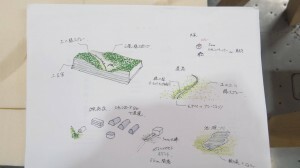 They printed out the contour line of certain parts of the Kitakami mountains, and traced it to the form, cutting it to make mountain base, then applied the mixture of cement and soil carefully and delicately by hand. 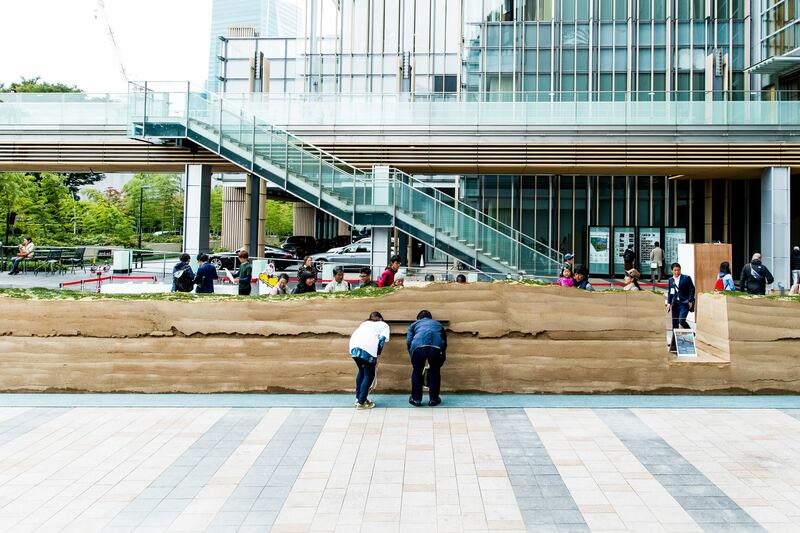 The team started on-site construction at the courtyard venue in Tokyo Midtown on 27 October. Ramming the earth was really tough work. Many students got blisters or scraped skin on their palms. What was worse was the weather. For the first two days of the construction, rain was pouring down. If the soil got too wet, it won’t harden properly. So the artists covered all the base with plastic except the parts, where they were stomping the soil under the tent. After finishing stomping soil, they moved the tent to the next part. It was an additional huge effort. After 24 hours of ramming by a total number of 300 people, the model was completed on 29 October, and the exhibition officially started. Again, students played another important role as science interpreter. Each student received a small crash course about particle physics and accelerators from an ILC scientist, and explained in their words the design and project to visitors. Shiori Watanabe, first year student of Musashino Art University, felt great joy in showing their work to so many people at one of the most fashionable places in Japan. “It was a wonderful experience to get direct responses from visitors. I could feel the process of design attracting people and that they understood our explanations,” Watanabe said. Of course, she and most of the other students did not have previous knowledge of particle physics or particle accelerators. “I learned that you cannot communicate with other people if you don’t explain something in your words.,” said Momo Ohashi, who studies scenography, display and fashion design. To explain the exhibition, student team needed to learn about theILC and particle physics that were totally new information for most of students. So, they picked up the point which attracted them the most, digest it in their own way, and talked to the visitors with their passion for the art work. Riku Matsui,another leader of student team, said that the experience at the exhibition awakened his intellectual appetite: “I learned a lot during this exhibition about various fields: architecture, leadership and particle physics. I met many people, especially foreign visitors who have a burning desire to learn, and I now also want to learn more”. With this exhibition, ILC gained many supporters from outside of its usual community by the power of design. In the near future, one of them could be leading the real construction of the ILC.